Yellow gazpacho & ratatouille from Chef David Burke. Photo by me! I discovered this book Great Chefs Cook Vegan and was so intrigued I had to order it. Not only is it beautiful, it’s completely inspiring and a must-have for any food blogger or serious cook, vegan or not. If you’re not “into” vegan food, don’t let the title dissuade you, this is seriously beautiful food, elevated to art. The plating and styling will inspire you, even if some recipes might be too involved to ever make at home. It’s easy to see why it won “Best Vegetarian Cookbook in the World Award” from Gourmand International. Linda Long, the author, is graciously providing one copy for a lucky reader. The cover image is a recipe by Thomas Keller of The French Laundry, Purée of Sunchoke Soup with Pickled Red Radishes and Country Bread Croutons. SWEEPSTAKES IS NOW CLOSED. It’s a fantastic concept. Linda, a food photographer and lifelong vegan, asked 25 top chefs from around the country to provide several of their favorite recipes and photographed them. She has a detailed biography on each chef so you can learn his or her history and perspective on plant-based cuisine. I loved learning more about Marcus Samuelsson, Charlie Trotter, Cat Cora, Jose Andres… it’s a long list of culinary luminaries. I also appreciated how vocal they were about the need to support people’s dietary needs at their restaurants, and hope that more chefs and restaurant owners take heed. I now understand why fine dining restaurants are so expensive. 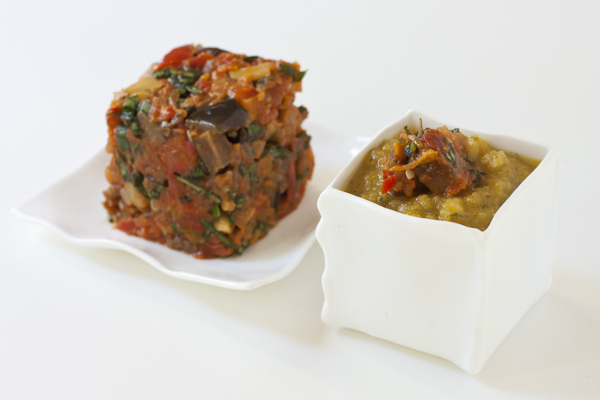 Each dish has at least three and sometimes five or more components, each with its own recipe. Not only is there a lot of time involved, but having so many ingredients on hand makes the dishes expensive as well. I tried the Yellow Gazpacho and Ratatouille from Chef David Burke (pictured above). The finished gazpacho was richly flavored although it would have been helpful if they had indicated to puree it without the vinaigrette, as the final soup was overly vinegary. Comparing mine to their photo, I don’t think their version included cilantro, because theirs was straight yellow. I also couldn’t figure out their instructions for straining out the pulp, I ended up with watery juice, which didn’t look like the picture, so I gave up and recombined it. The ratatouille was delicious and I had fun plating it as instructed. 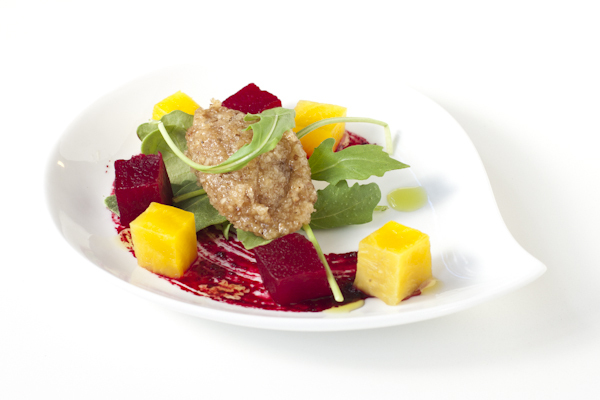 Beet Salad with Beet Reduction, Walnut Chutney, Arugula, and Chive Oil from Chef Daniel Boulud. Photo by me! I also made Beet Salad with Red Beet Reduction, Walnut Chutney, Arugula, and Horseradish from Chef Daniel Boulud. That dish has SIX (count ’em) six components, so I only made five. I nearly burned the beet reduction (after cooking it on too low a flame for an hour, but had enough for the photo). And then I forgot to plate the croutons. I had never used a pastry brush to plate a sauce, so that was fun. What I liked about the book: I loved the chef bios and learning about their history; seeing their portraits helps make them approachable. The photos are gorgeous, as is the creative and stunning presentation of the dishes. I love how this elevates vegan food way past tofu and seitan. I also enjoyed the glimpse into the kitchens of these phenomenal chefs. I will find inspiration in this book for years to come. Most of the recipes are gluten-free. (If you win the book and are gluten-free, just ask me if you have any questions.) There is an excellent glossary in the back to fill in some of the gaps. I wasn’t so keen on: how some of the recipes are described and explained. They assume a very high level of knowledge that many home cooks won’t have, and the steps aren’t always described in enough detail for someone not trained in culinary school. For example, I know what “sweat the shallots” means, but I’m guessing that many will not. Because of the multiple components, many of the dishes—as presented—aren’t realistic for a home cook to make, but any one component or sauce would absolutely be worth trying. A few of the recipes require ingredients that a home cook wouldn’t have, like isomalt, Irish moss, black truffles, or fresh fava beans. But that shouldn’t dissuade you from buying or entering to win this book, as it will completely inspire you! Please note that this is open to residents of Canada. I heard you! 🙂 SWEEPSTAKES IS NOW CLOSED. What is the fanciest meal you have ever eaten? What made it so memorable? By leaving a comment below you are agreeing to the Official Rules, outlined here. Only U.S. and Canadian residents over the age of 18 are eligible to enter. Duration: Friday October 12 through Thursday October 18, 2012 at 5 PM Pacific Daylight Time. SWEEPSTAKES IS NOW CLOSED. Leave a comment answering the question to enter: What is the fanciest meal you have ever eaten? What made it so memorable? You can receive up to 4 additional entries by doing the following and leaving one comment for each additional item. Cookbook is vegan. Some recipes contain gluten and/or sugar. Winner will be selected by random number generator within one day of the sweepstakes closing. Winners have 48 hours to respond to their notification email to claim their prize. If they do not respond, another winner will be chosen by random number generator. All prizes will be awarded. This sweepstakes is sponsored by Recipe Renovator, P.O. Box 34054, San Diego, CA 92163-4054. (619) 365-5065. 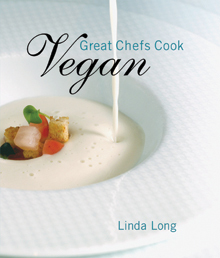 Prize description: One softcover copy of Great Chefs Cook Vegan, retail value of $24.99. In my pre-vegan days, I was taken to a fancy NYC restaurant by my then-boyfriend who knew the chef. We were wined and dined like we were celebrities. The fanciest meal was at Natural Selections, a vegan restaurant in Portland. My husband and I went for our first wedding anniversary and each had an amazing four-course meal. It’s so wonderful to have upscale restaurants that cater to vegans and vegetarians now! Fanciest meal…ages ago, at The Black Sheep in Amsterdam. Not vegan, though! Fanciest vegan meal? Probably the vegan Thanksgiving feast I made last year! fanciest meal I have eaten was at a high end restaurant in california that made me a special vegan meal ahead of time. it was memorable because it was overlooking the ocean on a cliff, and because each course had a lot of wonderful flavors and looked gorgeous. Last week some friends and I visited a modern Italian restaurant…handmade pasta, great wine, and a live jazz band all set in an intimate space with great atmosphere. It was great! This looks beautiful. One of the fanciest meals I ever had was this thing that I guess people call a secret kitchen. You make reservations for a set date and menu, but the location is a surprise. A local chef did one in DC and it was all fancy with a lot of weird gastro-science stuff that I don’t know much about. The most memorable part was the dessert – vegan ice cream made using liquid nitrogen. The fanciest meal I’ve ever eaten was a picnic in the woods hosted by three friends all enrolled in the food and nutrition program at Washington State. The part I remember best: fresh-ground coffee, and Grand Marnier in snifters… Thanks for the chance to win the book! One of my most memorable nice restaurant meal was at Hangawi in NYC. It’s a vegetarian Korean spot that I had been lusting over for a long time. I love Korean food – I love the freshness of the food and I love how it’s presented. The flavors are always popping! I don’t go out to fancy restaurants because of my chronic fatgiue & fibromyalgia. I would love to win the cookbook and see improvements in my health. I really need to focus on what I eat which is difficult to do on a tight budget. I’m hoping the cookbook will get me started in the right track. I wish everyone goodluck on their journey to eating healthier. I ate at a high end local food only type restaurant. I remember the yogurt chips and some pear/ginger ice cream. Very good. But now I am vegan so I probably won’t go there again. The fanciest vegan meal I ever had was a Millenium in San Fran. Fred and I went there when we were visiting. The food and service were incredible. One of us had the fall tasting menu the other had the regular tasting menu. Of course, I was taking pictures of the food the whole time. I think they thought we were food critics because we got a few extras throughout the night. The room was so pretty too! I love the fine dine and hope to get to try out some of the recipes in this book! I did the tasting menu at Pure Food & Wine in New York a few years ago. I went with three other people and each of us got something different for every course, so we tried EVERYTHING on the table and pretty much sampled the entire menu! The food was just exquisite and the company was great…it was a brilliant night. The most memorable meal I’ve had to date would have to be dinner at Alinea in Chicago. It takes the concept of “food as art” to an unimaginable level, without sacrificing taste or satisfaction. It was a unique marriage of 20 stunning courses, each one tiny- hardly more than a bite or two, and each bite perfection. The presentations were often whimsical, yet understated, allowing the combination of colors, flavors and textures to shine. Following your blog via email! I can’t say as though I have ever had a fancy meal, believe it or not! I do play up my oatbran for breakfast quite a bit! 🙂 The ratatuoille looks amazingly delicious! The most amazing meal I’ve eaten thus far is in San Sebastian (Donostia), Spain, at a restaurant called Akelarre. The restaurant has been around for over 30 years and is run by chef Pedro Subijana, who was just a delight to meet. I had lunch (the only reservation available) there, where I was seated at a table overlooking the ocean. I chose the Aranori tasting menu, which was absolutely amazing. Not only was the food delicious but the presentation was amazing and playful: the starter was presented on a pharmaceutical tray with bottles that held tomato/basil gel that you pump out of the bottle onto a piece of bread that was shaped like a sea sponge. The moisturizing face cream jar held the most famous Basque cheese – Idiazabal, so creamy and delicious. There was also a little plastic bag (edible) that you pop in your mouth after you ate the cheese. The other courses were made of nature looking items – a scallop that looked like a rock but once in your mouth, you could taste the ocean. Then there were the prawns, that were cooked table side in a”Oroju” fireplace and served with the freshest french beans I’ve ever tasted. There was mollusks that were cooked over charcoal and topped off with a rice/borage fisherman’s net. Then that was followed by crystallized cod fish with eatable shavings and topped off with tomato water. My favourite dish was the pasta carpaccio with Parmesan cheese shaped into woody mushrooms. My dining neighbors invited me over to their table for dessert (egg & almond traditional cake with foaming coconut ice cream and also apple cream puff covered in house made edible apple paper) and lots of celebratory champagne. Chef Subijana came to our table to personally thank us for dining at his restaurant. He obliged us with stories of his travels and signed copies of his cookbook and took pictures with us. His warmth was the punctuation on a great foodie experience. A note: although many of the dishes I mentioned were not vegan, the care and humanity of how the food was foraged, prepared and presented, farm to table upscale dining, was why I think this was worth mentioning. Truly a great experience that I still am happy to recount here. The fanciest meal I’ve ever had was at Millennium in San Francisco. The ambience is lovely and the food is, of course, excellent. Especially memorable were the fried oyster mushroom appetizer that began the meal. Completely decadent and so delicious! I would love to win a new vegan cookbook! The fanciest meal I ever had was in Chicago’s Chinatown. I was invited by members of the Asian art community in honor of a guest. There were many courses, from simple to complex presentation. The thing that made it “fancy” to me was the formality of the protocol and beauty of the presentation. I consider the order and appearance of foods in an entirely different way and that experience gave me an understanding I didn’t get from my cultural background (Midwestern US). It was with some friends, we dumpster dive only vegetables and fruits and we then went to the house were we clean the food and prepare it…my friend made some kind of broccoli with carrots salad, and some baked potatoes. the meal was just a meal, because my philosophy is not what you are eating, is with whom and with how many…meaning that best meals are shared. Steak Tartare prepared table side. (I know, probably the furthest from vegan fare…) It was while on a date with my step-dad. It was to be a fancy dinner and really good seats for The King and I with my mom. But she had to fly to NY for a family emergency. So I got to go in her place. It was a super magical night. I felt like a princess. I was 18. I’m 40 now. Still one of my most treasured memories. The fanciest meal I ever ate was at my brother and sister-in-law’s home for a holiday. She has incredible china (Russian pre-revolution) crystal, and she is an artist. I wish I had taken pictures of the table before we started eating. The food was served in four courses. It was even more elegant than eating in a five star restaurant. They are carnivores but they made sure that I had plenty of delicious vegan options. I subscribe to Recipe Renovator via email. I Follow Recipe Renovator on Twitter. I Follow Recipe Renovator on Facebook. My fanciest meal was Roasted duck in cherry sauce, I waited an hour and a half to get seated. When the waitress brought my plate to me she spilled the whole thing on my lap. I had just purchased brand new clothes to wear. I never did get to eat it. Oh go ahead and cry, I did, and so did the waitress. I subscribe to your newsletter in my email, and also to your blog via google reader. The ‘fanciest meal’ I ever ate was from a fine hotel restaurant in Des Moines, IA (the name is escaping me right now) but it was an amazing seafood pasta that the chef had included pearl onions with. My first experience/taste of pearl onions and I’ll never forget it! Miraculous. Probably Thanksgiving dinner with the family, the first time I prepared it myself. It was so fun and had courses. That’s about as fancy as I get. This book could help me!